Well the sun has been shining this weekend, perhaps not quite as much as the forecasters predicted on Friday, but I’m not complaining; it has stayed dry and been warm(ish). Had today to myself, so have probably spent longer in the garden than is really wise, but it has been very productive. Out early and on the allotment first thing, I was determined to complete the weeding of the rhubarb bed (I’ve christened it that just because it’s where the rhubarb grows, and makes the allotment sound a little bit productive!) I’m hoping the allotment agent will hold to his promise to strim the grass verges for me as that and the freshly dug soil will immediately lift the presentation of my little piece of ground. 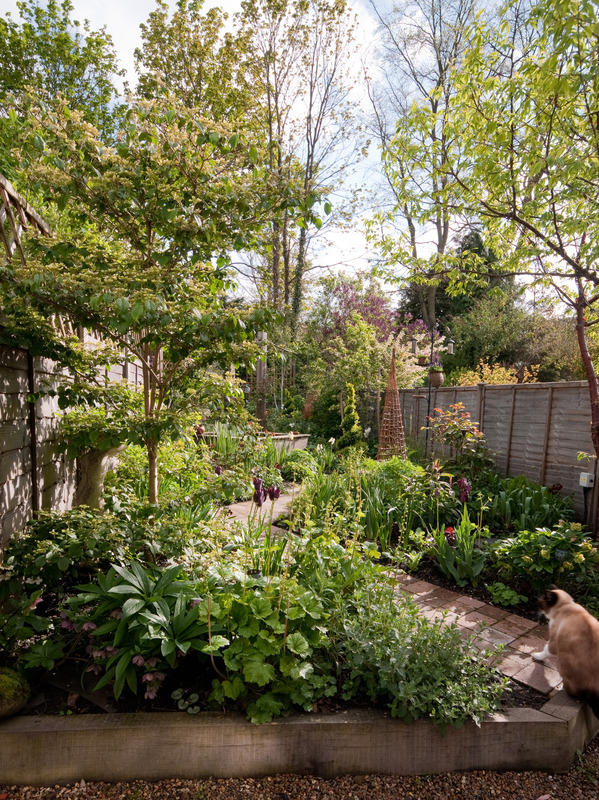 It also means that on my next visit I can either start to dig over one of the large beds, or faff around with the compost bins, even perhaps a bit of both just to ensure I do spend some time standing upright rather than bent over my spade. As well as a plastic composter of the variety that you throw all the weeds etc into the top and (eventually) shovel out lovely crumbly humus to make David Bellamy proud, from a little door at the bottom I also have a very overgrown heap fenced on three sides by some wooden pallets. Both require a good dig out, turning over and putting back again; such fun! Whilst at the garden centre I also treated myself to a few packets of annual seeds; Larkspur, Nigella and Cornflowers – these will go into the rhubarb bed to give me some flowers for cutting in a month or two. Then, before I wrote this post I ordered myself a new gardening book or three (oops!). Two have been recommended to me via my Recommended Reading page, and the third on planing a bee friendly garden was inspired by the various bee keeping blogs I’ve been reading. I’m not ready for bees of my own yet, but this way I can make sure I help along those bees that do stop off at my garden. This entry was posted in Adventures in my allotment, In my garden and tagged allotment, compost, gardening. Bookmark the permalink.